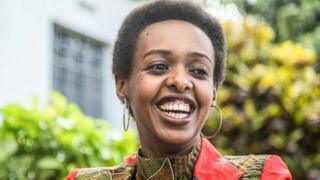 A Rwandan court in the capital, Kigali, has acquitted government critic Diane Rwigara and her mother of charges of inciting insurrection and forgery. Ms Rwigara has been imprisoned for over a year, after being barred from running in presidential elections against the long-standing incumbent Paul Kagame. The Rwandan politician denied the charges, which she had said were politically motivated. A three-judge panel told a packed court all the charges were "baseless".